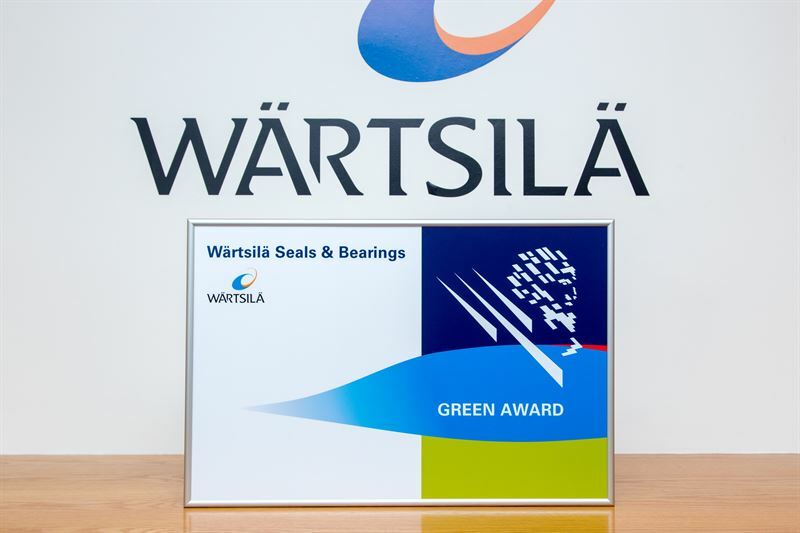 Wärtsilä Seals & Bearings, part of the technology group Wärtsilä, and Green Award Foundation have announced their cooperation in environmental protection. Wärtsilä Seals & Bearings has joined the Green Award scheme as an incentive provider to further encourage reduced emissions and a clean, sustainable future. “Green Award Foundation welcomes Wärtsilä’s long commitment to a clean environment and reduction of the ecological footprint of shipping. Wärtsilä demonstrates not only technological leadership, but leadership in building awareness of sustainability and safety in the shipping industry,” says Jan Fransen, Executive Director of the Green Award. The Green Award helps vessels and marine operators to achieve and maintain the highest safety and quality standards through improving procedures and optimizing performance and equipment. The Green Award is a voluntarily quality mark for sea-going and inland navigation vessels that go beyond the industry’s regulations in terms of safety, quality and environmental performance. Over 630 inland navigation barges and more than 260 ocean-going vessels are Green Award certified. “As one of the marine industry's leading players, Wärtsilä aims to enhance both environmental and operational efficiency of its customers. Wärtsilä provides solutions that help customers eliminate pollutants, and tools to protect the fragile marine ecosystem,” says Rob Burford, Vice President of Wärtsilä Seals & Bearings. The solutions of Wärtsilä Seals & Bearings that help to protect the marine environment by eliminating oil pollution to the water include a comprehensive range of marine seals designed for use in various propulsion applications, bearing solutions as well as stern tube solutions for water and oil lubricated applications. Wärtsilä provides integrated products and services that offer lifecycle efficiency, reduce risks through reliability, and are environmentally sustainable. For instance vessel upgrades and modernisations for reducing fuel consumption, ballast water treatment, exhaust gas cleaning and engine emission measurement as well as waste, oil and fresh water management creates both environmental and economic benefits. Wärtsilä is a global leader in smart technologies and complete lifecycle solutions for the marine and energy markets. By emphasising sustainable innovation, total efficiency, and data analytics, Wärtsilä maximises the environmental and economic performance of the vessels and power plants of its customers. In 2017, Wärtsilä's net sales totalled EUR 4.9 billion with approximately 18,000 employees. The company has operations in over 200 locations in more than 80 countries around the world. Wärtsilä is listed on Nasdaq Helsinki.